There are three species of Barberry: European Barberry (Berberis vulgaris), Japanese Barberry (Berberis thunbergii) (both alien), and American Barberry (Berberis canadensis). They are shrubs with very sharp thorns and yellowish wood. The branches of Japanese Barberry & American Barberry shrubs usually curve up, over, and down towards the ground. However, European Barberry grows more like a small tree. 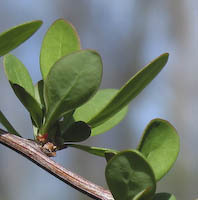 The leaves of European Barberry are prominently spiny-toothed. The leaves of Japanese Barberry are untoothed (entire). The flowers/fruits of European Barberry hang down in racemes (longish clusters). The flowers/fruits of Japanese Barberry hang down from the branch singly. American Barberry (Berberis canadensis) does not occur in Ontario. American Barberry (Berberis canadensis) "Some training is needed in order to identify the American Barberry (Berberis canadensis) with confidence. The species can be distinguished from the two similar and more common introduced species by several characters. Japanese Barberry has solitary or umbellate flowers, simple spines, and its leaf margins are always entire. European Barberry is harder to distinguish; it has gray bark on its second-year branches (rather than brown, purple, or reddish), each margin of its leaf blade has (8-) 16-30 teeth (rather than 2-12 teeth), and its racemes are 10-20 flowered (rather than 3-12 flowered). 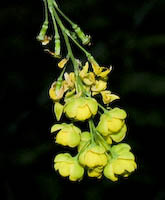 According to one source (Gleason and Cronquist 1991) other important differences between the two include the notch-tipped petals and indistinctly-veined leaves (beneath) of American Barberry, vs. the round-tipped petals and prominently reticulate-veined leaves (beneath) of European Barberry." Barberry species are also featured on the Ontario Wildflowers website.